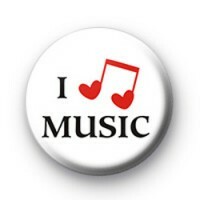 I Love Heart Music Badge. Fun 25mm pin badge. Everyone loves music right. Even at school. Punk Rock Metal Emo Pop.